Dontech, Inc. has developed IMO-bond™, a proprietary process of applying rigid optical filters (e.g., contrast enhancing, EMI/RFI shielding, or Therma Klear™ transparent heaters) to electronic displays via a refractive index matched optical (IMO) bonding process. 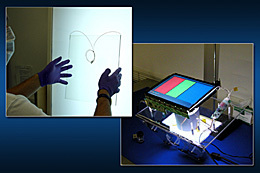 IMO-bond™ includes a family of durable, index-matched adhesives that optically couple a cover glass or touch screens to the display to eliminate reflection losses. Most commercial off-the-shelf (COTS) displays are not designed for direct viewing in bright, outdoor conditions. Dontech developed the IMO-bond™ process specifically for the enhancement of such displays operating in high ambient light conditions when the amount of light reflected by a display is close to or exceeds the amount of light emitted by the display. At this point, the contrast loss can be close to 100% and will cause “washout” as the display’s luminance is exceeded. Employing IMO-bond™ optical coupling of a contrast enhancing cover glass to the front polarizer of the display virtually eliminates reflections from the rear surface of the optical filter and the front surface of the display system. Dontech’s IMO-bond™ process is ideal for enhancing electronic displays that are commonly used in outdoor and high ambient light applications such as GPS and instrumentation systems used in marine, avionic, military, medical, and industrial environments. Copyright © 2019 Dontech, Inc.